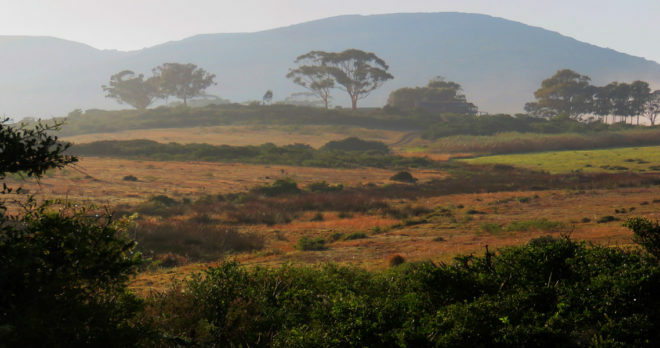 Our South Africa Cycling Tour will introduce you to a spectacular region filled with beauty and surprise. From the majestic coastal roads of the cape to the vineyards of the interior, South Africa is wildly diverse and rich in natural attractions. South Africa is also emerging as an important economic and cultural center of the continent, it has a stable economy, the local people are friendly and it is truly a hidden gem for a cycling destination. This is a rare find indeed! 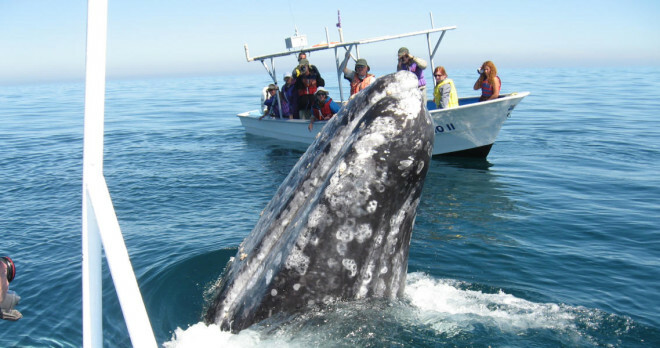 We can also make this a CHARTER TOUR for groups of 4 or more on any dates you choose. You invite the people and we take care of all the details. Just give us a call to arrange your dream cycling vacation! 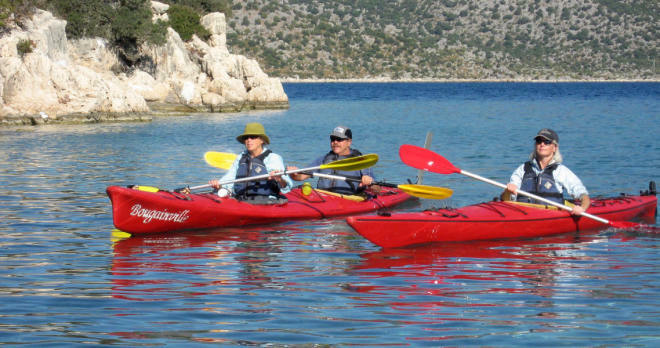 Groups of 4 or more people can charter this tour – contact us with your choice of dates. We rate this tour moderately challenging. Daily distances will be between 30 – 70 km and several days will include around 700 meters of climbing. We will have a support vehicle that will be available to give riders a lift. * This is an approximate price, based on the South African Rand / US Dollar exchange rate, which fluctuates daily. The actual trip cost is 45,000 South African Rand per person. * This is an approximate price, based on the South African Rand / US Dollar exchange rate, which fluctuates daily. The actual cost is 5000 South African Rand. 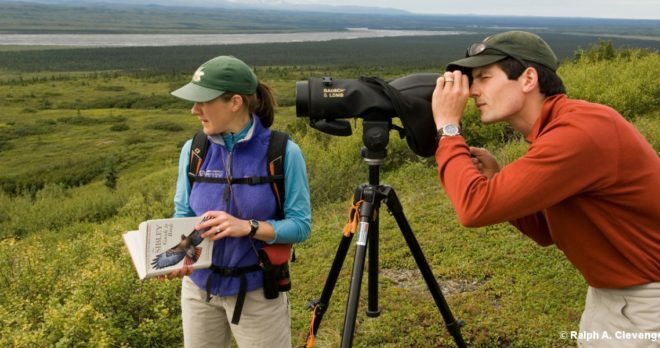 A non-refundable deposit payment of $1,200 USD per person is required to book this tour. Deposit amount subject to change with fluctuation of South African Rand currency. Day 1 Mid afternoon tour introduction and bike fitting. Arrive at the George, South Africa airport and we will arrange your transfer to the guesthouse in Wilderness. 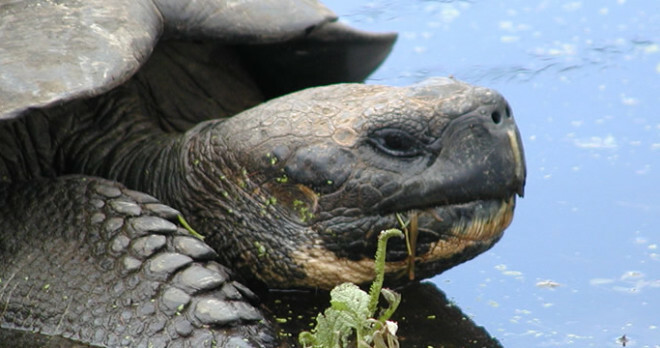 George has many flights a day from both Cape Town and Johannesburg. Wilderness is just a 10-minute ride from the airport. 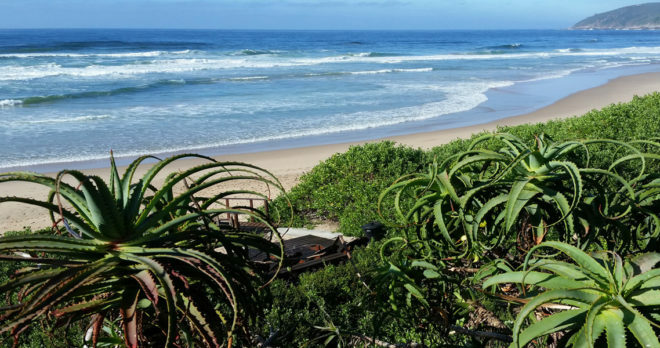 Let us know if you would like to arrive a day early to get over jet lag as our guesthouse is in a wonderful location on the Indian Ocean with miles of beach to enjoy. Meals begin with a welcome dinner on Day 1. After breakfast, we will transfer to a quiet road just west of Mossel Bay on the Garden Route. There is very little traffic and the road is fairly flat, making it a great place to adjust to South Africa riding on the left side of the road. Our route takes us to the Garden Route Game Lodge, which is set against a backdrop of the majestic Langeberg mountain Range. 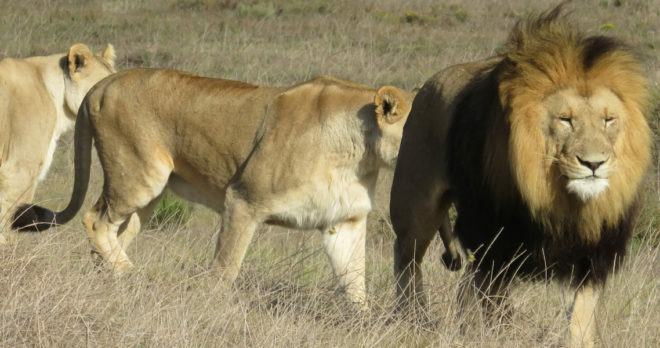 The Garden Route Game Lodge is a private reserve that hosts an incredible variety of wildlife: Zebra, wildebeest, springbok, eland, impala, ostrich, rhino, hippo, lions, elephants, giraffe, buffalo and cheetah. 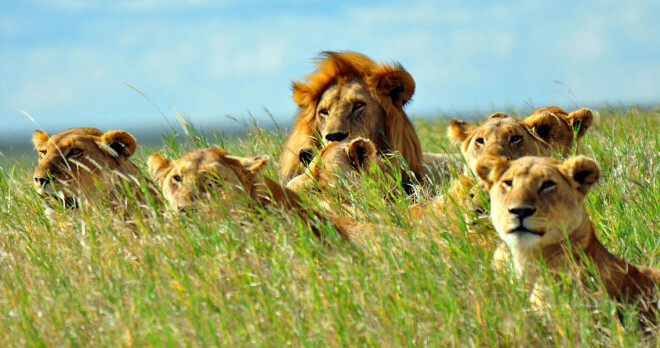 We will arrive by bike in time for a late afternoon game drive before sunset and dinner. And no worries, this is a malaria-free area so no pills are needed. Just after sunrise is the perfect time to view animals on our morning game drive. 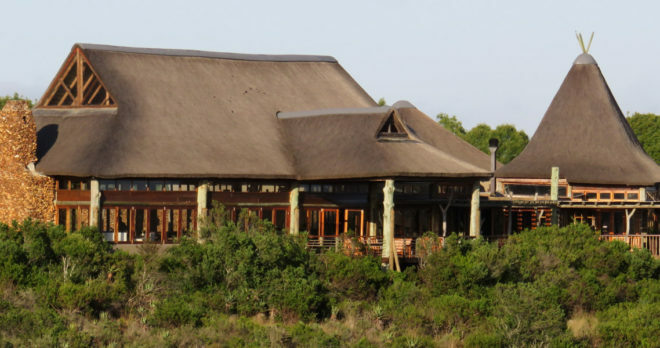 Following the game drive, we return to the lodge for breakfast. Then, we will depart by vehicle to the start of our ride that takes us over the historical Tradouw Pass to the breathtaking scenery of Tradouw Gorge. We finish our ride in the quaint town of Barrydale, an important fruit and wine region nestled in a fertile valley bordered by the Langberg and Swartberg mountain ranges. Our lodging tonight is in a charming country inn. Beginning in Barrydale, we ride over a mountain pass to Montague. The scenery changes dramatically as we pass through the Klein Karoo, a semi-desert region renowned for its spectacular vegetation – aloes, milkbush, concertina plant and succulents. South Africa is well known for its great number and diversity of plant species, and we will see many of them during our rides. We will visit the village of Montague and then continue to our lodging by vehicle. We will be staying at the Nuy Valley Guest Farm, a hidden gem in one of the most beautiful valleys of the Cape Winelands District. There, we will have an afternoon wine tasting before a scrumptious dinner at the farm. 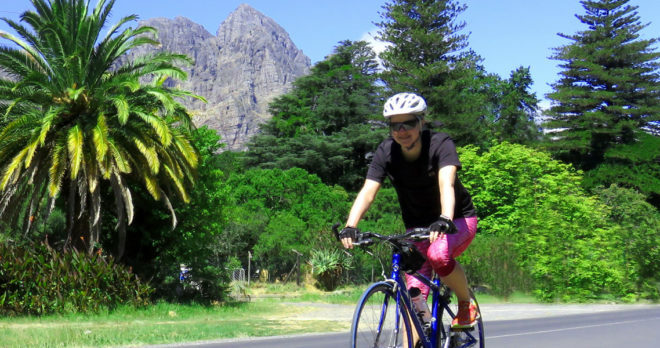 We start out riding the back roads from Nuy Valley to Villersdorp, then we transfer by vehicle to Franschhoek where we spend 2 nights in a lovely guesthouse. Settled in 1688 by French HTHuguenotTH refugees, Franschhoek is one of the oldest towns in South Africa and its name in Dutch means “French Corner.” Some of the original HTCape Dutch-style farmhousesTH can still be seen today and there are a number of renowned wineries in this valley. Dinner tonight is at one of the famous wine estates. Today you have several options. Option 1: Have a rest day, walk around Franschoek, enjoy lunch at a sidewalk café and take in the scenery. Option 2: Take a ride in our support vehicle to Stellenbosch, the wine capital of the region. En route, you will make a stop to see the Nelson Mandela memorial before continuing to Stellenbosch for lunch. Option 3: Ride one way into Stellenbosch, join us for the lunch and transfer back to Franschoek in the support vehicle. Option 4: Go the full distance and ride out and back from Franschhoek to Stellenbosch where you will enjoy the food, wine and chocolate. We return to the guest house in Franschhoek for the night. After breakfast we transfer to False Bay for a spectacular ride along the Indian Ocean. 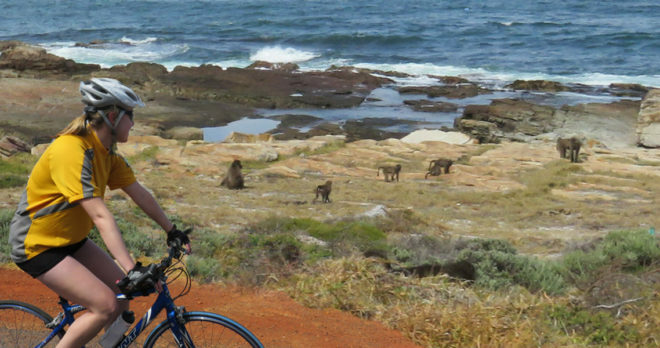 This is a beautiful stretch of coastline cycling where baboons are often seen along the road. The entire ride is one postcard view after another. We end our ride near Gordon’s Bay, and transfer to Simons Town, one of the prettiest towns on the Cape Town peninsula. 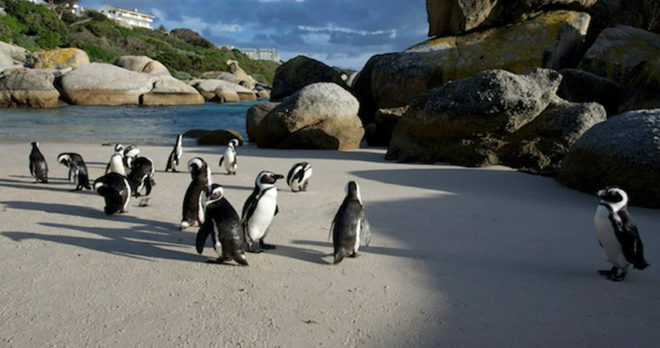 In Simons Town, we will walk along the coastal path to visit the famous colony of African Penguins. These flightless birds roam freely around the area, so you can get relatively close to them. This is a truly special experience. Our lodging is in Simon’s Town in a wonderful B&B with views of the bay below. For the next 2 days we will be riding the most scenic portions of the Cape Town Cycle Tour, the world’s largest timed bike race that occurs each year in mid-March. The dates of our bike tour are set to avoid this race and we will have far fewer riders on the road. 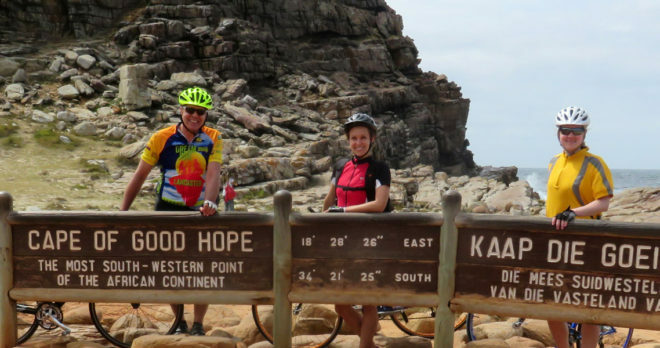 Beginning in Simon’s Town, we ride south along False Bay, enter the Cape Point Nature Reserve and continue to the Cape of Good Hope, the most southwestern point of Africa. This is a day to savor, with so many scenic stops to photograph the spectacular scenery. 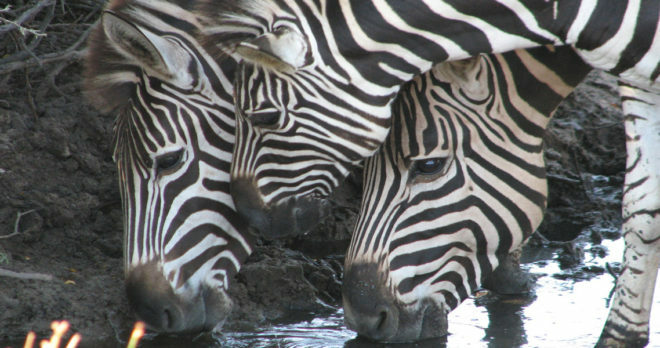 Ostriches, antelope and baboons may also be seen along the way. Our ride continues through the lovely seaside villages of Scarborough, Misty Cliffs and Kommetjie before reaching Monkey Valley Resort, a spectacular locattion that overlooks the Atlantic coastline. We will be spending 2 nights here. Today is the grand finale ride and you will not be disappointed! We start from the resort and ride north along the Atlantic coast on the famous Chapman’s Peak Drive to the town of Camps Bay. After a break, we will be returning on the same road to the Monkey Valley Resort. The scenery is spectacular in both directions, with splendid views of Table Mountain and the Atlantic. You can choose to ride the entire 60 km route take a transfer whenever you would like. We return to our lodging at the Monkey Valley Resort for our Farewell Dinner. After breakfast we will arrange transfers into Cape Town and to the Cape Town airport. For those of you wishing to spend some time in Cape Town after the trip, we can offer suggestions for lodging. Our Guided Bike Tours will connect you with the local people and customs of the region. Your guide will show you the best route and introduce you to the traditions, history and culinary treats that make each country so unique. Our Guided Bike Tours have a support vehicle to carry luggage and any riders needing a lift, and there is always someone to do bike repairs. Your guide will make sure the tour goes smoothly and help you get connected to your new surroundings. 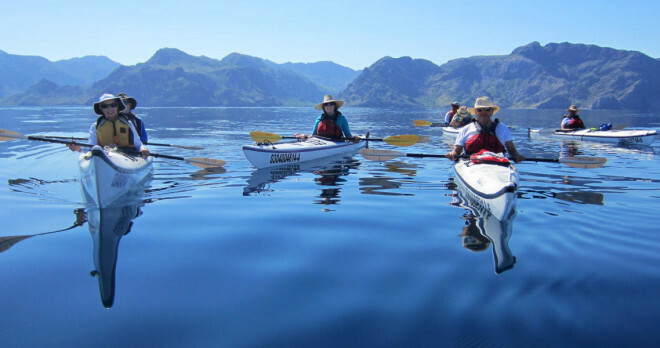 Nichols Expeditions is an owner operated tour company that specializes in Biking, Hiking, Sea Kayaking and Wildlife Tours in North and South America, Europe, Africa and Asia. 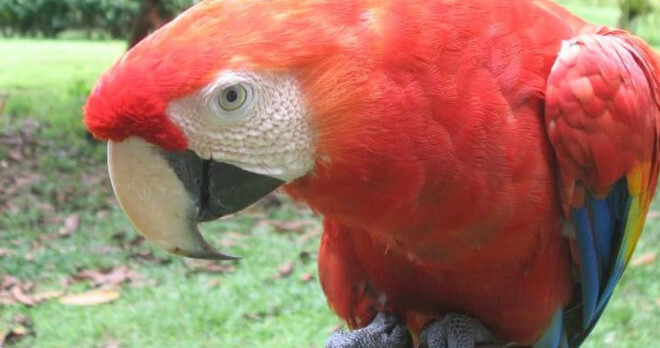 Since 1978 Chuck and Judy Nichols have been guiding tours and developing a worldwide network of exceptional international tours for all abilities.